A three-day operation has been carried out in the Kincardine and Mearns area to tackle vandalism and anti-social behaviour. The operation, held between Friday, 2 June, and Sunday, 4 June, focused on areas where it is known there had been issues with vehicles being damaged and anti-social behaviour. Several groups of youths were spoken to by officers and a small quantity of alcohol seized. There were no incidents of any vandalism reported. 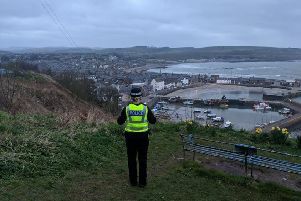 Officers also dealt with three calls regarding noisy music in the Stonehaven area. A 25 year old man was charged and issued with an Anti-Social Behaviour Fixed penalty ticket. “In addition the operation sent out a clear message that we will actively pursue those responsible for the commission of crime and anti-social behaviour in the Kincardine and Mearns area. These crimes impact on the local community and we will do everything we can to identify and report offenders. We would ask for the help of the local community in providing information about people they know who are committing crimes in our area.